Durability, portability, charisma, appeal and utility—the Hampton Beach collection has all the qualities of a well-rounded and much-loved outdoor set. Product Description Fantastic Teaks. The Hampton Beach outdoor dinette set invites you to come home to your own neck of the woods, with its familiar and comfortable yet rugged charm. Laid back and breezy as a summer day, this set embodies the spirit and grace of the great outdoors, from slender yet strong frames to smooth and rhythmically curved silhouettes. The familiar and natural appeal brings out both the hardy woodsman and the charismatic host in anyone. Customer assembly required. Unique Features: Natural teakwood brings you back to your roots with its rustic yet smooth surface. Whether you’re enjoying coffee with friends or throwing a large get together, you’ll need a handy and stylish bistro table for guests. 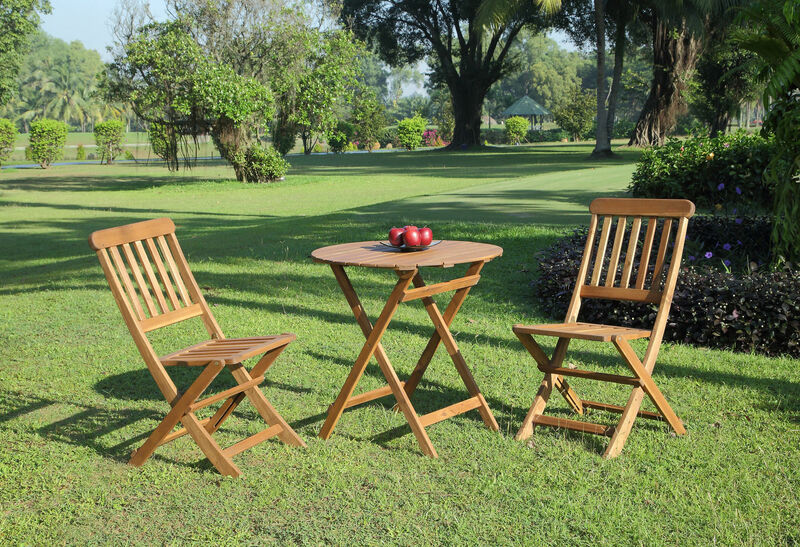 Wooden frame supports all manner of drinks and food, for a variety of use and durability. Construction: Built from acacia solids for sturdy and durable construction.